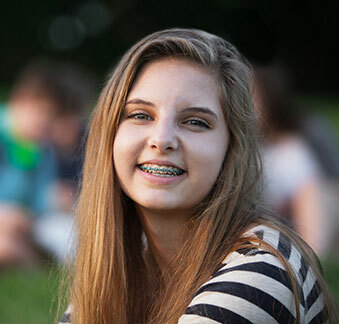 Taking care of your oral health is a whole different story when you've got braces. That's why Ozier Orthodontics has teamed up with Crest and Oral-B OrthoEssentials, a program that can help patients with braces stay on track with keeping a clean and healthy mouth. With the help of OrthoEssentials, patients can steer clear of common problems such as gingivitis, tartar, and demineralization, which can result in additional time and expense — and get the most beautiful and healthy smile possible. OrthoEssentials puts together everything a kid (or adult) with braces needs in one convenient kit. It combines the PRO-HEALTH SYSTEM — an ideal collection of oral care products for a someone with braces — with simple educational tools that show patients what their goals are, how easy it is to achieve them, and how to keep tabs on their progress along the way. Oral-B® Professional Care SmartSeries 5000 Electric Toothbrush with Oral-B® Ortho brush head, and Oral-B® Power Tip® brush head. SmartGuide® Oral-B electric toothbrushes are lightweight and have a built-in timer to help users brush for the recommended two minutes. The Oral-B Ortho Electric brush head is specifically designed to clean around brackets and fits on all Oral-B oscillating electric brush models. Oral-B® Superfloss® that has a stiff end threader to let you easily thread floss under your wires. Crest® PRO-HEALTH® Clinical Gum Protection Toothpaste with stabilized stannous fluoride, which protects against plaque, gingivitis, cavities, and sensitivity. Crest® PRO-HEALTH® Complete Rinse with anti-cavity fluoride protection, which rebuilds enamel to help prevent cavities. Dealing with braces can be a pain. They're hard to clean, stop you from eating foods you like, and can make your mouth sore. But if you learn the best ways to care for them, you can keep your mouth healthy and your braces hassle-free. Even if you think you're already a pro, it's a good idea to review the right way to brush, floss, and more. Braces are tricky, and you might find ways to improve. Your braces may be here to stay, but the right tips can make living with them much easier. Good cleaning habits are crucial for orthodontic patients because sloppy oral care can cause unattractive stains and actually lengthen the amount of time that patients have to spend in braces. Research indicates that every poor oral hygiene entry into a patient's chart increases treatment time by an average of two and a half weeks. Three or more poor oral hygiene entries into a chart can increase treatment time by as much as nine and a half weeks. This can cost extra money and add up to a lot of additional unwanted time in braces.